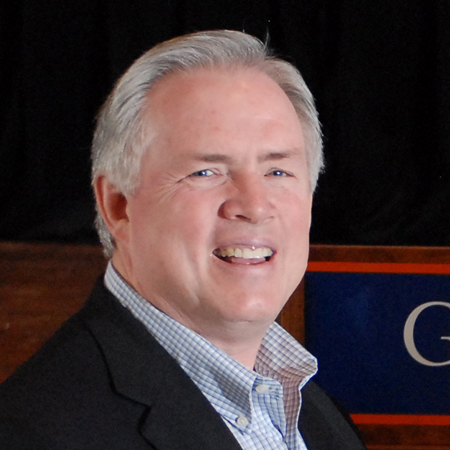 Presidential Search Committee Chair Charlie Scott Discusses Search on The Gettysburgian’s Podcast | The Gettysburgian. Last Thursday, Gauri Mangala and Ben Pontz, News Editor and Editor-in-Chief of The Gettysburgian, respectively, sat down with Presidential Search Committee Chair Charlie Scott on the newspaper’s podcast On Target to discuss the status of Gettysburg’s search for President Janet Morgan Riggs’ successor, a daunting task given her long and distinguished tenure at the college. President Riggs announced her retirement last spring, which will take effect next spring after 11 years of presidential service and more than 30 years of affiliation with the college as a student, faculty member, administrator, and finally president. Shortly thereafter, Scott was appointed the head of the search committee, appropriate given his decade-long affiliation with the Alumni Board of Directors, the final four years of which he served as its chair and representative on the College Board of Trustees, and subsequent service as Vice Chair of the Board. Scott looked for diversity and a gender balance as he looked over the recommendations to form the Presidential Search Committee (PSC). The team now consists of 13 members: seven from the Board of Trustees, one student, three faculty members, one support staff member, and one administrator. This fall marks the beginning of the search phase as applications are sent in, and Gettysburg actively seeks out applicants who “were unaware of their interest,” Scott quipped. Going into the winter, the committee will begin the interviewing stage of the process in which it will meet with 15 to 20 applicants of those who generally meet their criteria. Finally, nearing spring, the committee will narrow a set of “finalists” and ultimately make a recommendation to the Board of Trustees. Throughout the process, Scott made it clear that all the campus community still has a say in the Presidential Search and can send in questions and comments online. This person can come from any background, not just academia or more specifically an alumnus of Gettysburg College, Scott said. What Scott stressed the most is, regardless of this person’s background, they must be able to “listen, learn and understand the culture of higher education and at Gettysburg” to adapt to the Gettysburg community before wanting to mandate change. Nicole DeJacimo ‘22 is a staff writer for The Gettysburgian who primarily writes for the features section. She is from the Jersey Shore and sings in Audeamus. She plans to major in Political Science and double minor in Music and Writing. Follow her on instagram @nicoledejacimo.